Have you ever noticed that your photos seem to look grainy, noisy, or pixelated?! Today, we’re breaking down the reasons why! Well…it’s your lucky day, because I am going to not only tell you the exact answer you need but also give a super awesome tip that’ll help you have great looking and clean photos (even when shooting in less than ideal conditions). Let’s get down to business and answer your question! Grain, also known as noise, is the wayward pixels you see in an image. The pixels aren’t representing the true color or exposure of the of the scene. Perhaps I shouldn’t divulge the answer too quick or you might leave, but I am a “to-the-point” kinda guy. ISO is the culprit here. Are you familiar with what ISO and what it does exactly? If not, skip over here to my tutorial on understanding ISO and then jump on back. ISO (or ASA) is a term originating from the film photography days which referred to film sensitivity to light. The lower ISO film number (100,200,400 etc…) the lower film grain or noise one would get on their final image. The exact same idea applied today, in the digital world. The only difference is, instead of light sensitivity of the film, it is how sensitive to light the camera’s imaging sensor is. So the key to understand is ISO simply is a reference, and unit of measure, as to how “sensitive” your camera’s sensor is to light. The lower the number, the more light, and the less grain. The higher the number, the less light, and more grain! Since ISO plays a vital role within the exposure triangle (how aperture, shutter speed, and ISO interact with each other to make each exposure), your “proper” ISO setting will change based upon many factors. However, one thing is certain, the higher the ISO number, the more grainy your photos will become. In addition, your photos will not only have more grain than you want, but your photos will also have a less dynamic range as the ISO is higher. …But one thing is certain – the higher the ISO number, the more grainy your photos will become. How do you stop a picture from being grainy? The first and most obvious way to lower the grain in your photos is to shoot with a lower ISO setting. Sometimes we can lower our shutter speed or raise our aperture a little and lower the ISO. Another option may be to switch to a faster lens in your kit that allows you to lower your shutter speed or aperture, thereby lowering your ISO. For example, I have to shoot my 70-200mm f/2.8 lens at 1/200 of a second to avoid camera shake. But I could switch that lens out for a 50 mm f/1.8 lens and use my feet to zoom. Then I could potentially lower my shutter speed to 1/50 of a second (assuming all other things being equal). The most common thought would be to simply always shoot with the lowest ISO setting. This would minimize grain in your photos. But there will be times when you really do “need” to raise your ISO. If some unwanted grain comes along with it then so be it! An outdoor wedding with plenty of daylight. Lots of sun and daylight means I am getting plenty of light through my lens and into the sensor. This means I’ll be using fast shutter speeds (to prevent overexposure) and I can and should keep my ISO as low as possible (like ISO 100). This will give me the greatest dynamic range, which is the range of tonality in an image. It will also produce the best color in the photo. It will also virtually be completely free of any grain. 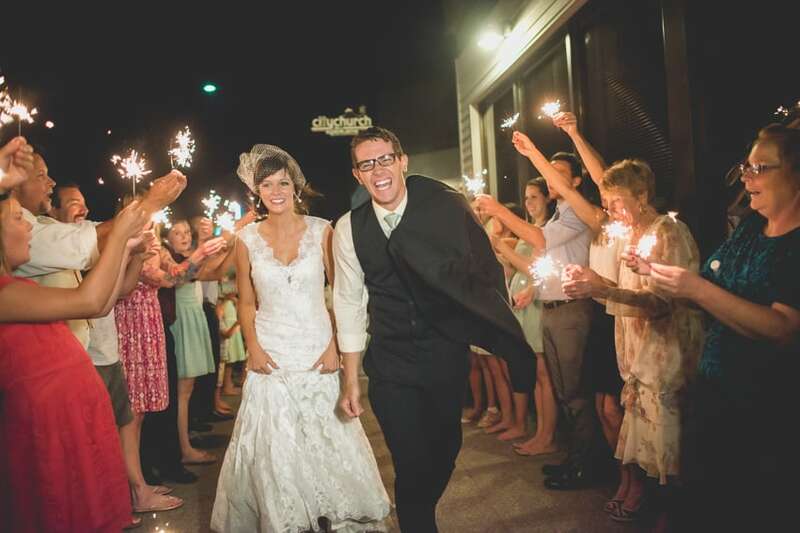 A wedding sparkler bride and groom exit at night outside and choosing to shoot with no flash. With this scenario, I have no light except the ambient lighting from the sparklers. The first thing that pops in my head (and should pop into yours too) is the need to have a fast enough shutter speed to prevent a blurry photo. As soon as you ever think of needing a fast enough shutter speed to prevent blurry photos, and you aren’t using flash, you need to automatically know to raise your ISO. You’ll also need to shoot at as wide of an aperture as possible to allow in as much light as you can to the camera sensor. From these two examples, you can now understand that selecting your ISO will always change depending on the situation you are in. Always keep this in mind: Use the lowest ISO required to get you a fast enough shutter speed. The High ISO Reducing Grain Trick! Sometimes you are going to have to shoot at really high ISOs and we have to learn to deal with it. But when you do, one trick to keep in mind is to slightly overexpose the photo in your camera while shooting and that will drastically reduce the amount of grain you will see. The reason why is that grain is more pronounced in the darker, shadow areas of a photo. If you underexpose in camera and then correct in Lightroom when editing you will actually introduce more grain, whereas if you do the opposite and overexpose by a tad you will effectively reduce some of the noise and grain. Try this trick and you’ll see what I mean. Another option you have to reduce grain in your image is to introduce additional light into your scene through the use of flash. We don’t recommend using the pop-up flash on your camera because it often causes red-eye and is usually much too harsh for your subjects. But a flash mounted in your hot-shoe or mounted on a light-stand off camera is an effective tool for adding light to a scene. Wedding photographers, for example, sometimes use an on-camera flash bounced off the ceiling or wall when shooting dark receptions or even to capture detail shots. The extra light from the flash allows you to lower your ISO, reducing grain in your images. There might be very specific reasons why you can’t or don’t want to use a flash. Birth photographers, for example, don’t want to be popping a flash in the delivery room. And some venues, such as churches and museums, don’t allow flash photography. We understand that. But know that is another tool available in some situations to reduce the grain. Why are my night photos grainy? Do you find your night photos are consistently grainy, even when shooting at ISOs your camera normally handles well? You aren’t doing anything wrong – this time your camera really may be to blame! During a long exposure, the camera sensor can heat up. This overheated sensor causes pixels to go rouge, giving you incorrect colors and exposures. Sometimes adjusting your camera settings to decrease the exposure time slightly can improve the results. As counter-intuitive as it might seem, raising your ISO and lowering your shutter speed may help produce a cleaner image! Some cameras have a tool that helps with long-exposure grain. Long Exposure Noise Reduction (LENR) or High ISO Noise Reduction works inside the camera as you are shooting. When LENR is enabled, your camera records the long-exposure image using your chosen camera settings. Then the camera records another darker image, almost as if the lens cap was on. Then the camera compares the two images and subtracts the noise from the dark image from your original image, reducing your long exposure noise. There’s a catch, though. Enabling LENR takes the camera time, sometimes up to double the amount of time of the original exposure. If you’re taking 30 second exposures, it can take a minute or more for the camera to process the image using LENR. If you’re taking a 10-minute exposure, be prepared to wait a while. The extra time can make in-camera noise reduction impractical for really long exposures. You might not have 20 minutes to spend on every shot. Or you might be shooting star trails and the gap in time will throw off your results. But if you can afford to double your exposure time, it’s a tool worth trying. Test out your camera’s noise-reduction tool well ahead of an important shoot, however. Some photographers don’t like how their LENR works, feeling like reducing noise actually causes some blur or fuzziness. But test it and see how you like the results. Can you fix grainy photos in Lightroom? You’ve done everything you can to minimize grain in camera but you’re still left with noisy photos. Now what? 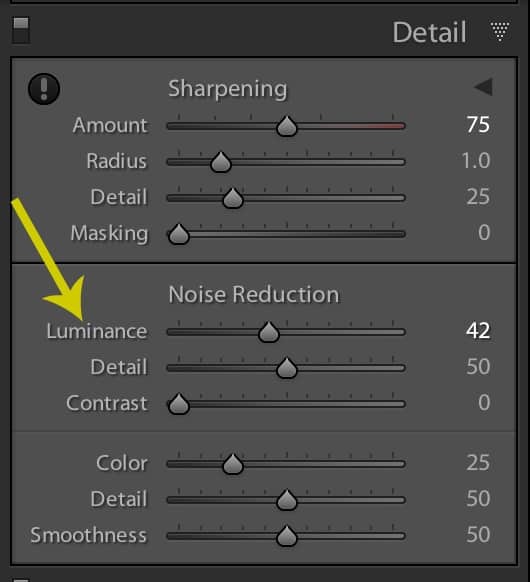 Both Lightroom and Photoshop have tools to help you reduce the noise in an image. In Lightroom’s Develop Module, use the Luminance slider in the Details panel. Simply move the slider to the right to reduce noise, using caution to not take it too far. Too much noise reduction can result in loss of detail in your image, giving them a “plastic” look. So be sure to keep an eye on the overall appearance of your image when using this feature. Adjusting the color sliders under noise reduction can also help reduce color noise. Adjusting color, detail and smoothness in different combinations can help reduce the grain and still give you an image you like. Unfortunately, there are no standard noise-reduction settings in Lightroom that will work for every photo. It is simply a matter of using the sliders to get the result you want. Some Lightroom preset packs come with noise reduction presets, but you might need to adjust those as well for your specific image. Can you fix grainy photos in Photoshop? Adobe Photoshop has a specific filter for reducing noise in an image. Choose Filter>Noise>Reduce Noise. You’ll see a pop-up window giving you the options of Strength, Preserve Details, Reduce Color Noise and Sharpen Details. Adjust these sliders until you get reduced grain and achieve your desired quality. As in Lightroom, sometimes you can go too far and the image stops looking realistic. Now that we know WHAT causes grain in your photos I want to give you a checklist of HOW you can minimize or even correct grain in your photos after the fact. When shooting at higher ISOs, slightly overexpose in camera. Understand that while editing the photos, raising the shadows or increasing the exposure to a photo can introduce or even magnify grain. Within Lightroom, in the develop module, utilize the Noise Reduction sliders to quickly and easily reduce visible grain. Or use noise reduction filters in Photoshop. Reduce Noise & Grain with 1 Click with My Newest Preset Collection! Really helpful tip. I am a victim of above discussed issue. Will try to implement during my next shoot and see how it works. Thanks once again for your tips. 2. about over expose , you should shot in raw to fix it dont you? This is great! I have been getting so mad at my camera over this!!!! I can’t wait for my next low light session! Turn off the lights 😉 Then practice haha…have fun! Thank you Cole, I’m becoming a better photographer. Keep sharing! Cole, this is extremely helpful; I will give it a try. Keeping this in mind: Use the lowest ISO required to get you a fast enough shutter speed. If the aperture is already at the lowest stop possible, how would you go about underexposing? Thanks a lot! I don’t understand your question…. if you are trying to underexpose but at the lowest ISO then you can close down the aperture (higher f stop #) or use a faster shutter speed. Your camera’s meter looks at the scene and determines the correct exposure based on the area you are metering for. Your meter will try and balance light and dark areas, thereby resulting in a histogram which is centered in the middle region. An easy way to overexpose is to add positive exposure compensation (use the +/- button) which will take the meter reading and add the desired amount of additional exposure to the shot (keep in mind that this does not apply to full manual mode and that results could vary shot to shot if you do not lock the meter reading). I’m not aware of cameras that show the meter reading in the viewfinder except when using full manual mode. In aperture, shutter, and program modes, you may be able to see the exposure compensation scale depending on what type of camera you are using (move scale to positive side for overexposure and negative side for underexposure). Hope this helps you! Great read, I have a question. During the first dance, dj lights are going, I use second curtain flash and a slow shutter speed to capture some of the lights whilst keeping the couple sharp, I use a low iso yet I still get grain, why is that? Great blog post. So useful! how would you suggest over exposing slightly for fast action? every bit of shutter speed helps in my main shooting. i can never use anything higher than f2.8 (sometimes f4) for my indoor action shooting due to the harsh lighting conditions. Hi i bought your lr 8 hour video session is this covered in it? Also i just swtiched to a full frame canon 6d from my 50d and not matter the light I see grain…help. I had to buy my camera just hours before a wedding since mine died…and now i have 800 grainy photographs. Yes I do go over noise removal in the course. That will definitely help you. Thanks! This was very helpful! Thanks Cole! How do you over expose in camera without using the flash? Hi, first time reading you, I ask, why none of the experts talk like that, always going around and around, never to the point. Thanks for your honesty. I will read more of your post, I am new to photography and old. Hope I also can make a great get answers from your desk. Sincerely, Rc. Ok I’m new to all this. I have a D 5300 and all my pictures come out grainy. Today I shot a pair of shoes in natural light with a tripod. I had the mode on AP priority f 22 because I wanted as much in focus as I can get. ISO at 200. The camera chose the shutter speed. My pictures looked in focus well lite but still so grainy as if a 4% noise was applied. People with cheap cameras set to auto get better pictures. What is my problem 🙁 ARGH! Did you shoot the shoes at wider apertures, too? Were they also grainy? Are you shooting RAW? That is very forgiving! Have you shot on Auto to see what the auto settings are? For Carris – What is your image quality setting? RAW is best. Next best is jpg fine and large. Perhaps shoot in both RAW and jpg until you figure out what is best for you. Next, I would read and study the manual from front to back, with the camera in hand and practice everything you read. Hope that helps. I forgot to ask if the image was exposed correctly. What does the histogram show? If the exposure is off, that can increase grain. Perhaps you’re metering incorrectly if that’s the problem. Thank you! I’m still learning and trying to wrap all this of around my head. As someone that is a ‘reactive, point and shoot’ type of hobbyist photographer, I get a bit lazy with my settings. This is a really terrific, AND HELPFUL, tutorial! I have been shooting DSLR since the NIkon D70. Had a digital Minolta Z1 prior to that but more limited so doesn’t count, and film SLRs and film medium formats before that. But, I learned something new in this article. I do know about ISO and ASA, exposing for the right of the histogram (generally), spot reading a middle tone in the scene, and noise in the shadows. But, I didn’t know the idea of overexposing to counteract noise. It can create some issues that can also be corrected, but is still a do-able idea. If you look, you will always learn something new. This is some really good information. I, have at times struggled with graininess and find myself in Lightroom trying to clean it up. It is very time consuming and I don’t want to be doing that. AWESOME tip Cole! awesome info never thought of over exposing at high iso …. Thank you Cole! Your insight into overexposing in camera is good info to know. I will keep this in mind on my next shoot. Great advice and very practical. Fantastic easy directions, Cole do you mind if I bring other learning photographers online with you. I will always be learning even though I shoot and but am still in what I think a level that is prepro …. I try to teach for fun, as I see this section is exactly what I teach on the first lesson, three most important things to learn about your camera. I dont understand the question. I am shooting at the beach. Planty of sun. I want to use flash to minimize the shadows on the fcae. My camera (as the majority) shoots at 1/160 with a flash on it (max speed), i have to go for f16 , f14. But the results are catastrofic. Why is this happend .? Larger f stops with slow speeds are bad combinations ? I keep my ISO on auto, but still can get grainy photos. Can I not rely on auto? I most often shoot in av or shutter priority. I shoot raw on a Canon 7D mark II. Suggestions? How to Add Your Logo into Lightroom in 3 Steps! What Exactly is a Lightroom Workflow?